Common in open habitats throughout four-county area, including cities, suburbs, farmlands, and managed forests. Absent from montane forested zones except along highway corridors and, by and large, from shrub-steppe east and south of Kittitas Valley. 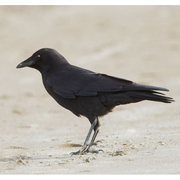 Populations along Puget Sound intergradient with Northwestern Crow (C. caurinus) inhabiting outer coast from Washington north. 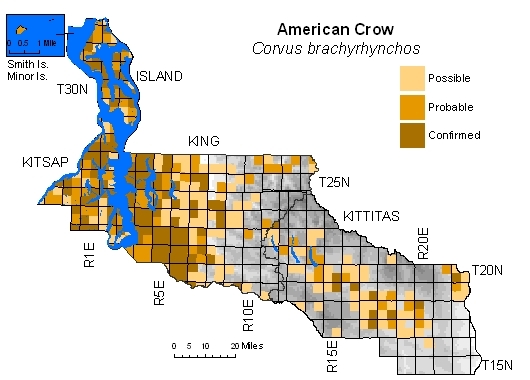 Extensive forest clearing following Euro-American settlement likely eliminated habitat barriers between original Northwestern Crow populations of Puget Sound and American Crow populations to east and south, fostering interbreeding to point that these two forms now indistinguishable in our area.